Pumpkin Bread in July.....sure why not! So it's been a while since I've posted here.........anyone still out there? I know I've been slacking for the last few years and I wouldn't blame anyone for not sticking around. Life seems to be flying by and I'm not sure where all the time went. Can someone enlighten me? Well hopefully it won't be years in between posts but no promises! Anywaysssssssss I came to the realization that I really like being able to come back to my blog and find recipes that I've made and really liked. I made a fabulous strawberry rhubarb tart with an amazing crumb topping last year but I couldn't find the recipe or even remember where I had gotten it from. Now I want to make it this year and I'm like crap! Don't you hate when that happens? You find a great recipe and then when you want to make it again you can't find any sign of what you had done. So in my search for the elusive recipe I saw a can of pumpkin in my cupboard and decided to drown my sorrows, I needed some pumpkin bread! Makes sense right? Well it did to me and I think I made the right choice. BEST pumpkin bread EVER! Lightly sweetened with a nice crunchy topping. What's not to like? I tweeked the recipe slightly because that's what I do. I made it slightly healthier and a little less sweet. Don't get me wrong I love sweets but I generally try to reduce the sugar in all recipes I make. Less sugar and healthier means that I can eat more right? Well that's what I tell myself. Preheat oven to 325 degrees. Grease 2 8x 5-inch loaf pan. Beat sugar with oil and apple sauce until blended. Add eggs, one at a time, beating well. Continue beating until light and fluffy. Then mix in pumpkin on low speed. Add in dry ingredients on low speed and mix well. Pour into prepared pan. For streusel topping mix till crumb texture with a pastry cutter. 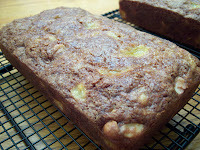 Then spread topping over entire loaf. Bake 60 minutes or until toothpick comes out clean. Cool 10 minutes; remove from pan and finish cooling. I can't believe it's been over a month since I last posted. Time flies! I can't believe that summer is already half over. I've been baking and cooking but posting seems to have taken a back seat to being outside and enjoying the sun. So most likely I will continue to be mia during the rest of the summer and posting sporadically. I couldn't pass up this weeks vanilla ice cream though. It's been hot here and it sounded like the perfect thing. Man am I glad that I didn't miss out this week. This pick was great timing by Lynne of Cafe LynnyLu. I loved the flavor of the ice cream but the texture wasn't what I was hoping. So I will have to experiment a little more. The texture was much better than my last attempt though, it wasn't as hard either since I added a tablespoon of vanilla vodka. 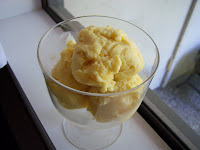 I've read that some people use some xanthan gum to make the ice cream smoother so I may try that next time. 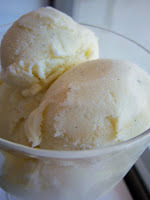 I used a whole vanilla bean and I think that's what makes this ice cream so good. Go check out what other bakers have done this week! This weeks pick was made by Tommi of Brown Interior. 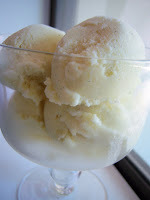 I just happened to pick up a new ice cream maker so I was excited to make this! I've never made ice cream before so this was a learning experience. I decided to use mango's instead of the peaches because I saw some frozen mango at Trader Joe's that I wanted to try. I thought that the ice cream turned out ok. It didn't have the mango flavor I was hoping for. Next time I will definitely use fresh fruit instead of frozen stuff. I was trying to be good and use only whole milk so I left out the heavy cream and I think that was a mistake as well. It wasn't as creamy as ice cream normally should be. My ice cream had a strong vanilla flavor so next time I would add less vanilla. 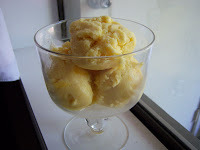 There were a couple of tips that I read that I wish I had known about before making the ice cream. I read somewhere that it's better to have the machine running before pouring in the ice cream mixture. I also was reading that adding a little bit of alcohol prevents the ice cream from getting rock hard, which mine did. So both are good things to know for next time. I will definitely be making more ice cream and maybe even frozen yogurt this summer. I can't wait to try all the possibilities! Go check out what other bakers have done this week. This week's pick was made by Jessica of My Baking Heart. This has to be the easiest recipe yet! There were only 4 ingredients and it was really good. I mean it was really really good. It's times like these that make me glad I decided to join the group. I probably would have never made this otherwise. It's SO simple to put together and I must say that it makes a great breakfast. Even two days later....I mean I couldn't let it go to waste! I ended up making 4 of these tartlets with Jazz apples. They took a little longer to get soft so my puff pastry ended up a little more brown than I would have liked even though I put on a foil tent for the last 5 minutes or so. So next time I'll make sure to watch them more closely and put foil on sooner. 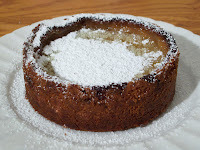 I think next time I might try sprinkling some turbinado sugar on the edges of the pastry. That would make it just that much better. 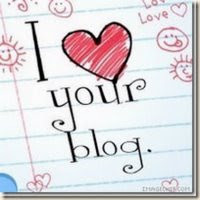 Let me start off by saying that I am so glad I didn't miss this week! This week's pick was made by Kelly of Baking with the Boys. It was a great pick by Kelly, everyone seemed to love it! I made lots of changes and I'm glad I did because it turned out really well. I wasn't too wild about adding raisins so instead I added coconut. I also decided to add a cup of macadamia nuts because I thought that the crunch of the nuts would be a nice contrast to the soft mango. I left out the ginger and only used half the amount of cinnamon. I ended up with two loaves because I was afraid that the batter would be too much for one pan. It works out better this way anyways because now I can give one away and so that means less for me to eat! Which is a good thing since summer is right around the corner. 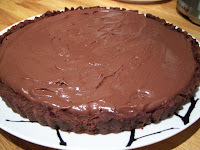 Go check out Kelly's site for the yummy recipe and check out what other bakers have done this week. This week's pick was made by Babette of Babette Feasts. I was a little hesitant to make the tart this week but since I skipped last week I decided that I would make it anyways. I should have listened to myself. I wasn't a fan of the tart although my friend liked it so he got to eat it all by himself. 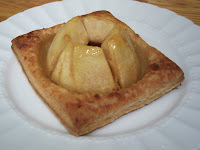 It was super simple to make the filling and a little challenging to make the tart dough in my mini food chopper. One day maybe I will get a real one! I had read that lots of people thought that the tart was too bitter. I did cut off the ends of the lemons so that would reduce the amount of pith and hopefully make the tart less bitter. I also added more sugar but it didn't help the bitterness enough for me. I'm glad I only made half the recipe. I used my mini spring form pans, but it seemed to take forever to bake so please excuse the dark crust! Hopefully I will have better luck with next weeks recipe! This week's pick was made by Kim of Scrumptious Photography. I've been a little overloaded with chocolate this month but I knew I had to give this a try. Luckily next month there is only one recipe with chocolate. I love chocolate but I need some variety sometimes! This was very chocolaty. 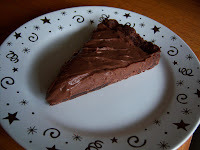 The filling reminded me of chocolate pudding. I only thought that the crust was ok. Might have to do with the fact that I used my last eggs up and didn't have one left for it. So instead I just added enough whole milk for it to come together. I really need to get a food processor some day. Then I wouldn't mind making crusts as much. I bet the tart would be really good with the whipped cream topping but I forgot to get some at the store so I just left it off. I'm sure I would have liked the tart a little more if I didn't leave it off. I would have help cut some of the chocolate. This will just be a lesson learned. Don't wait until the last minute and make sure I have everything I need! Anyways go check out what other bakers have done this week. I love to cook and bake but I don't do it as often as I would like. I'm hoping to get back into the swing of things but a thing call work gets in the way! Thank you so much Melissa for this! !